Tonight we took the lens cap off of the star camera on MinXSS-2, put the spacecraft on our homemade air bearing table and looked at the Colorado night sky from a mile high. We had a laptop outside connected to the wifi at LASP and so could monitor the real time telemetry beaconed from the spacecraft to the ground station on the roof, which also allowed us to send commands. The system reported that it could track 30+ stars despite some cloud cover and it was able to use the reaction wheels to stably lock into a fixed attitude. We also had the whole process recorded in preparation for a planetarium show all about MinXSS! 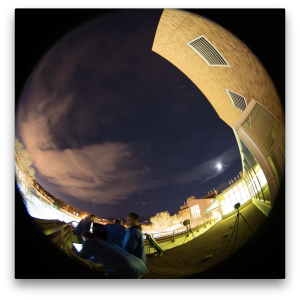 The photo to the left is a snapshot of one of the frames (compressed for 2D) of the night sky timelapse and you can see us all performing the test. We’ll let everyone know when the planetarium show is ready! We can distribute it to planetariums around the world, but there will be showings at our top-of-the-line planetarium: Fiske.